The LFM-300 Light Flicker Meter is a photometer with a fast sampling rate and it can take measurements of flicker, flicker index, stroboscopic depth, and modulation depth of light sources, both in the lab and in the field. 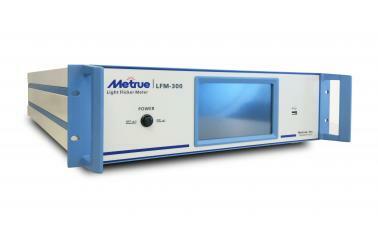 The LFM-300 can also be used to obtain the light variation curve and the frequency of flashing lights, auto xenon lights, and warning lights. For a stable source it can measure photometric quantities. All the measurements confirm to the standard ENERGY STAR flicker testing. The LFM-300 supports two working modes: Continuous test mode for steady illuminants, and single test mode for instant illuminants. It can also acquire luminous flux (or illuminance), the source waveform, and the analyzed results, which may be displayed on either the touch screen or a connected computer monitor.